What began as a way to manage vendor relationships has helped create a culture of compliance at Heartland Credit Union ($292.9M, Springfield, IL). Saddled with manual processes and an examination looming, the Prairie State cooperative adopted a compliance software system three years ago that had immediate and long-lasting impacts. That software deployment also provided the infrastructure for what, together with training, has resulted in enterprise-wide awareness of the rules and regulations that staff encounter in their daily activities. It must come from the top. Executive management must support their compliance department. Require all managers to be part of the annual policy/compliance review process. Provide consistent training and refreshers for staff on compliance. Make it part of a monthly or quarterly meeting or newsletter. Try to add some fun, such as prizes for correct answers or being the first to answer a compliance trivia question. Use technology to manage compliance, including policies/procedures updates and delivery and confirmation from staff. That takes so much of the burden of staying on top of compliance off the compliance officer and management. Strategy is a process. That's why Callahan & Associates has developed team learning experiences that help executives become more effective, make better strategic decisions, and ultimately thrive — together. Learn more today at Callahan.com/strategylab. Each department at Heartland has its own role to play in awareness and adherence to rules and regulations, even when they can sometimes be a creative downer. “You think you have a great idea, especially in areas like advertising, and then find out that by the time you put in all the disclaimers, it might not be worth it,” Loftus says. But heightened awareness can also be a force for good. For example, provisions in the federal Senior Safe Act signed into law just weeks ago make it safer for trained employees to report suspected elder abuse. According to Loftus, Heartland will train its front-line staff on what to look for. The move is one example of how Heartland is ramping up its compliance efforts and bringing the credit union more in line with the banks Loftus worked for before joining Heartland in 2013. That’s no knock on her new employer. It’s simply a recognition of regulator realities. 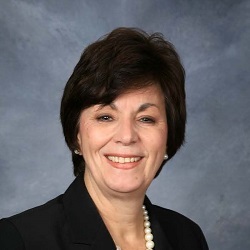 The 43-year banking veteran says she saw compliance change coming when she participated on the community bank and credit union advisory councils at the CFPB. Now, as the NCUA catches up with its counterparts at the OCC and FDIC, Heartland is taking an organizational approach to building a culture of compliance. 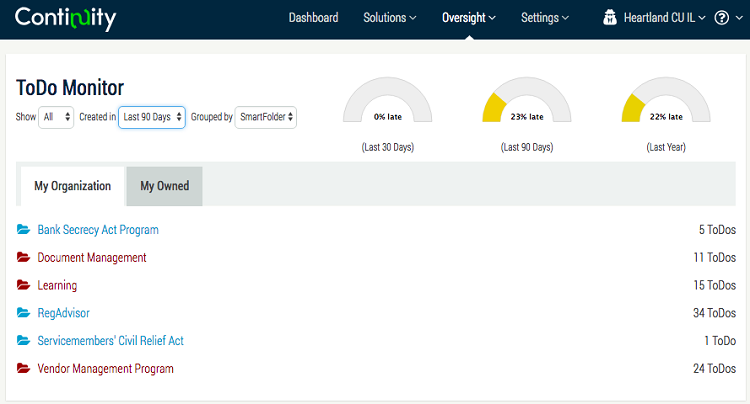 A sample screen shot from the compliance software at Heartland Credit Union shows areas of focus and tasks. The credit union initially deployed the Continuity compliance software to assist in vendor management, but all the cooperative’s policies and procedures are now in the software and all employees use it. A to-do feature ensures Heartland completes required reviews and obtains board approvals. Employees use the system for required training, and managers use weekly reports to stay in tune with their staff, Loftus says. All this helps the credit union stay in sync with examiners and the regulators who dispatch them. “As long as you can show you’re aware of the regulation, doing the proper research, and have a process in place to comply, examiners are willing to work with you if they have any findings,” Loftus says.